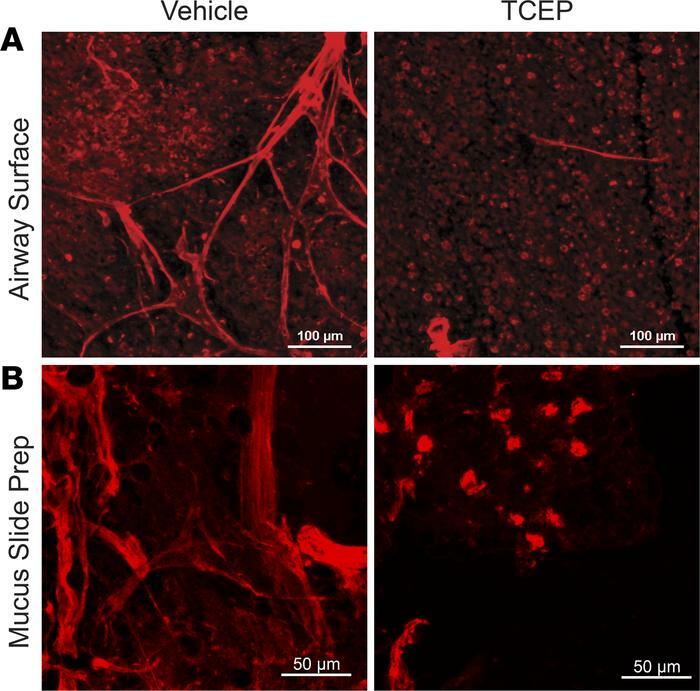 TCEP disrupts mucus strands in vivo. Fluorescence micrographs obtained after in vivo treatment with i.v. methacholine (MCH, 0.25 mg/kg) and inhalation of vehicle (0.5 ml saline) or TCEP (20 mM in 0.5 ml saline). (A) Images of fixed segments of trachea. MUC5B-positive goblet cells are present in background. Scale bar: 100 μm. (B) Images of mucus collected in vivo and smeared on a slide. Mucus was stained with rhodamine-conjugated wheat germ agglutinin (red), which labels MUC5B. Scale bar: 50 μm.